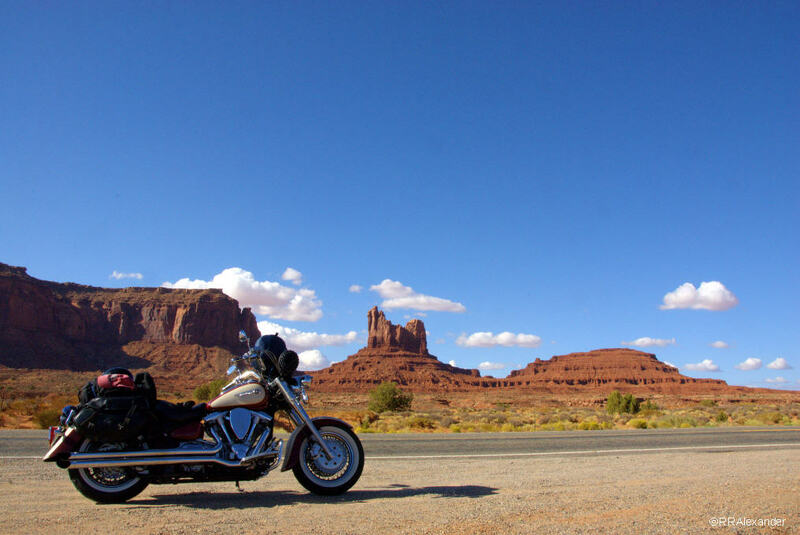 In September of 2009, I went on a multi-day motorcycle ride through northern Arizona and southern Utah. 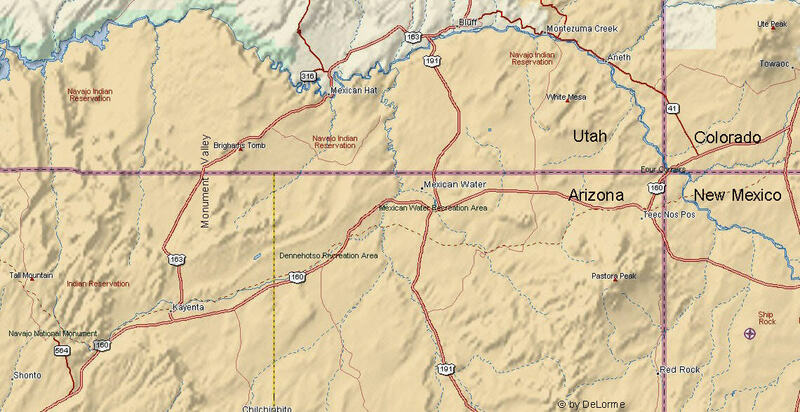 My route took me across California through the Lower Colorado Desert on Route 62 to Parker, Arizona, then north through the Flagstaff area toward the lands of the Navajo Nation. My destination was a loop of roads through southern Utah where I would camp at the Natural Bridges National Monument, then tour through Glen Canyon and Capitol Reef National Park before turning south toward home in Southern California on the final leg of the trip. The photos in this post are a few of the frames I captured in Monument Valley on that road trip. I’ve published photos from the other attractions on that ride such as Natural Bridges and Capitol Reef, but I never got around to these particular photos. I stopped for the first night in Flagstaff, 450 miles from home, and hauled my camping gear and saddlebags into the motel room. I set up the battery charger for the Nikon D200, and cleaned the lens with a microfiber cloth. I had only one battery for the Nikon, but if I was careful and turned it off when I wasn’t shooting, a full charge would last a couple days. The map shown here is courtesy of, and copyright by DeLorme. I thought about my plan for the next day. I’d ride north out of Flagstaff on Route 89, making a stop at Eldon Pueblo, an ongoing archaeological dig just north of the city, then follow the ribbon of asphalt through the mountains, past the Antelope Hills toward Navajo land. After crossing the Navajo Reservation, I’d continue riding north to Natural Bridges National Monument, where I’d camp for the night. The ride north from Flagstaff has always been a good one for me. The alpine mountains give way to a long downward slope bordering the Antelope Hills to the west. I’m always fascinated by those hills and imagine the way they appeared a few thousand years ago with deer and other big game dotting the hillsides. 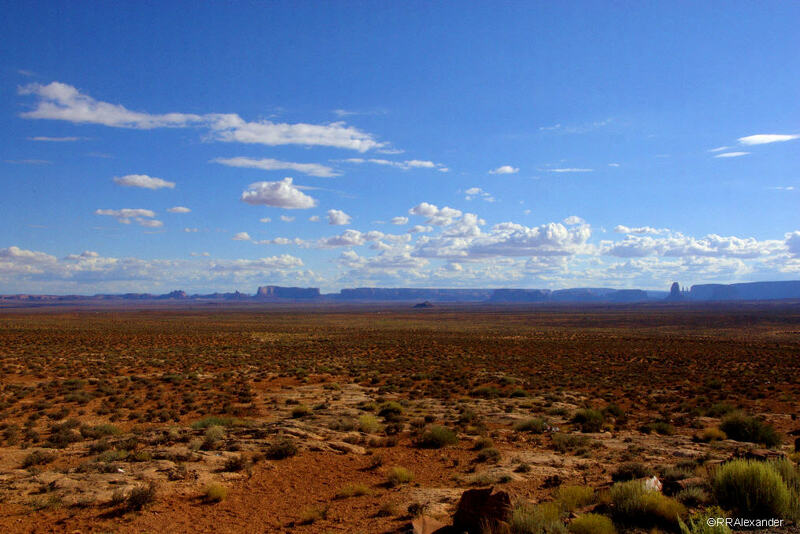 The view from the downslope is many miles long, so I can see into the Navajo Reservation in the north. In Kayenta I turned north onto Route 163. 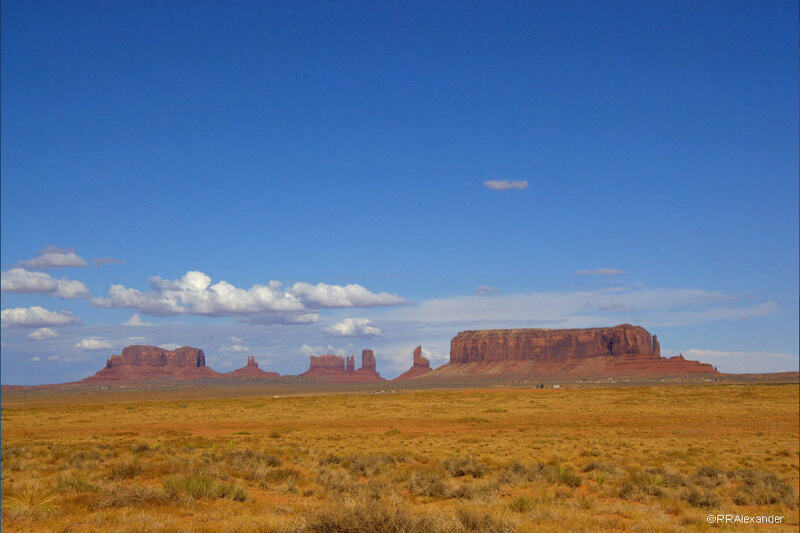 Between Kayenta, Arizona and Mexican Hat, Utah, that road traverses Monument Valley, another attraction on my long looping ride. 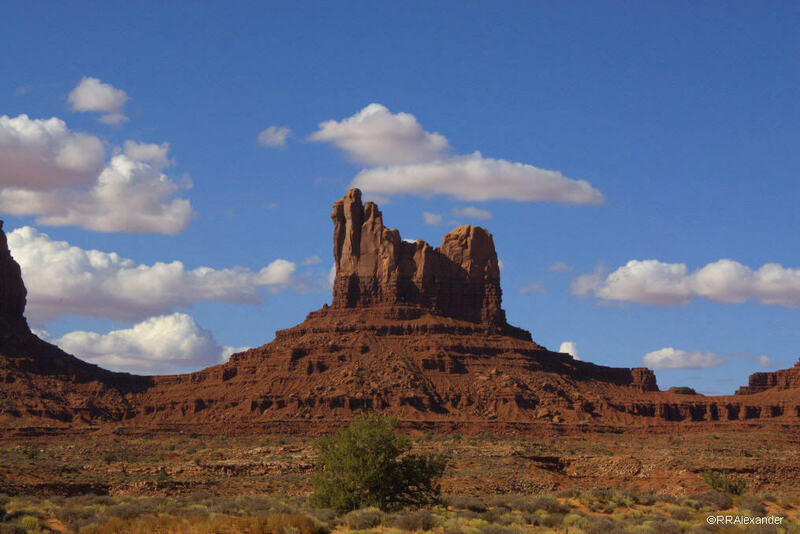 Though I’d heard about Monument Valley from other motorcyclists in the past, and noted the location on road maps, I’d never been down that particular road on my previous road trips to the Four Corners Area. 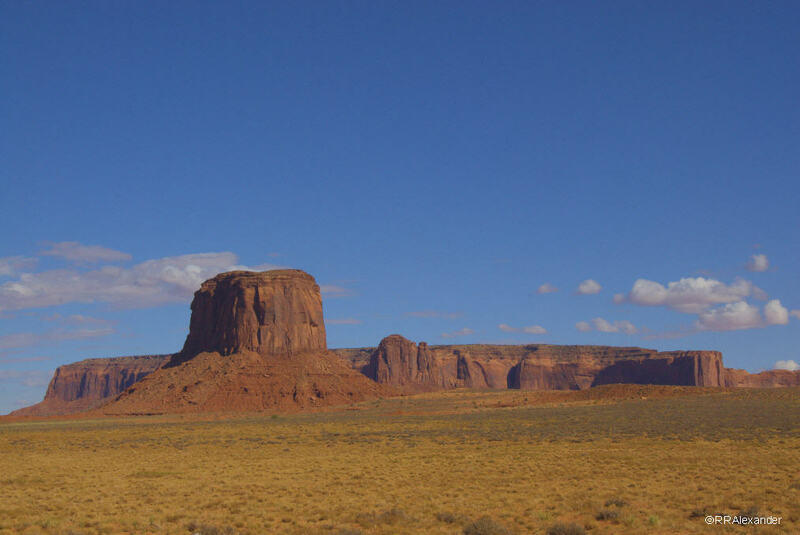 By the time I got to Monument Valley, the D200’s sensor was liberally dotted with dust, which is a continuous hazard in the desert. The D200 does not have a self-cleaning sensor. The only way to clean the sensor other than using the cleaning kits sold by photo suppliers, is to use a blower bulb. I don’t carry a blower with me on the road, preferring to clean the sensor at home. I should probably change that operating procedure, since the blower certainly wouldn’t take up much space in my luggage. All of the photos from that ride exhibited dust artifacts on the sensor. I never took the time to clean up the photos in this post, then forgot about them as I moved on to writing other posts.